Logan's Heating & Cooling is a full service HVAC products and services company with a years of experience and a genuine commitment to professional, affordable and personalized service. Our partners and staff come from a wide range of backgrounds, which provides our customers with versatility and stability. 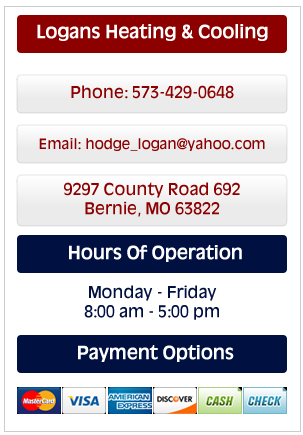 We service Bernie, MO and the surrounding areas. We hope you’ll take the time to see for yourself all Logan's Heating & Cooling has to offer you. We offer several services to help with all of your heating and air conditioning needs: Heating System Installation and Repair as well as AC System Installation and Repair. We are the best choice for quality HVAC products and services. Our technicians are well-trained and knowledgeable. They are not commissioned and will not try to sell you unnecessary parts or equipment. We have a years of experience doing installations and are equipped to repair all brands of heating and cooling systems. At Logan's Heating & Cooling, we pride ourselves on our superior service. We strive to provide the best value to our customers from equipment installation to maintenance and repair. We can obtain any product that you may need, for any provider. We install only the best, most energy efficient, and highest-rated products.